Rim Buntinas is the founder of WaveMachine Labs, the developer behind Drumagog, as well as the highly impressive new iOS DAW Auria. Give us a quick history of WaveMachine Labs. Was Drumagog the company's first product? "I started WaveMachine back in 1999 because I needed a way to replace drum sounds in my studio, so Drumagog was born. It's been our main product for over ten years, until we entered the iOS market with iGOG and Voice Band. But I've always wanted to make a DAW. The iPad seemed like a perfect platform. The idea of being able to take a true pro-level mixing and editing platform with you anywhere is what inspired me to create Auria." 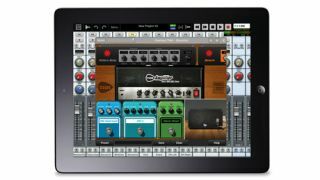 What were some of the biggest challenges in creating Auria, your iPad multitrack app? "The iPad is a very powerful device, but we were constantly optimising to squeeze every last drop of CPU out of the mix engine. It's one thing to do this when your end result is a 16-bit WAV file for iTunes, but our bar was very high in terms of quality. For example, Auria's mix engine is 64-bit throughout. "We also wanted to create an easy-to-use but powerful editor. Instead of working around the iPad's touchscreen to make an interface that closely mimicked a Mac or PC DAW, we chose to embrace the touchscreen. We created an editor that's a joy to use and yet exact enough to be able to perform sample, accurate edits easily." In what situations do you see Auria being more useful than a laptop running DAW software? "Our vision for Auria was to bring the studio to the place where creativity happens: on the couch, on vacation, at a practice space. A laptop can do this too, but an iPad takes it one step further. Plus, the touchscreen interface makes mixing and editing a more natural experience. You really have to try it to see what I mean." What was PSP's involvement with Auria? "We were looking for an effects company we could team with, and we turned to PSP first. We've known them for years, so it was a logical fit. It's been an amazing partnership. PSP provided the Channelstrip, the Masterstrip, several of the plug-ins, and general help and brainstorming throughout Auria's development. We couldn't be happier with the way that it's turned out." Are there plans to add more features to Auria? "Yes, MIDI and virtual instrument support are high on our list for future upgrades to Auria. We wanted to concentrate on the audio features first and get that right before we moved on to adding MIDI. We're already talking with virtual instrument vendors about porting their instruments." What's next from WaveMachine Labs? "We're having a lot of fun in the iOS world, but we've also got some ideas for Mac/PC plug-ins as well. A long-awaited update to Drumagog is also on our short list now that Auria is out."